FHI has more than 500 beneficiaries out of which over 150 are children in program (CIP). These CIP are solely dependant on FHI. They receive direct educational materials such as school uniforms, house and chapel dresses, shoes/sandals, PTA and other fees, books, foam mattresses, beds, soap, provisions, etc. Sadly, the poorest children tend to drop out from school when FHI lacks funding and fails to supply their basic educational needs. Another 390 benefiting from the FHI development projects are the entire school population of Cape Coast School for the Deaf. The remainder are various people with disabilities who have completed either the Junior or Senior Secondary Schools but have no further skills training or any work to do, and few cripples who have been identified and being helped by FHI. 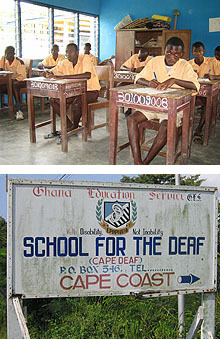 FHI’s presence at Cape Coast School for the Deaf (Cape Deaf) had contributed significantly the success of the school. As a result, the Ghana Education Service (the Government's sole agency for the development of education in the country) has upgraded Cape Deaf to pursue higher programmes in Vocation/Technical subjects. This fits exactly into FHI's aims. Cape Deaf is now complete with pre-Nursery/Nursery, Primary and Junior Secondary School (JSS) and Vocational/Technical for the post-Junior Secondary School or the Senior Secondary School - all for deaf children and youths. A Blind Department also started in 2003.